Location sound recorders have always fascinated me, from the first time I watched someone use a beautifully engineered Nagra III mono reel-to-reel recorder. The technology has moved on considerably from those days, but the engineering and ergonomic benchmarks set by Mr Kudelski have remained fundamental to all successful field recorders. Nagra still make location recorders, with the Nagra VI arguably defining the standard to which others aspire in the portable field multitrack market, but the eye-watering price is something only professional sound recordists could seriously entertain. Surprisingly, given the ubiquity of the computer DAW, there are plenty of very affordable studio-based multitrack recorders on the market, but it seems the additional technical and ergonomic demands of a field recorder add dramatically to the cost. Japanese manufacturers Zoom are attempting to change all that with their astonishing new F8 recorder, offering eight inputs and 10 recording tracks for a fraction of the price of pretty much any competition. At its core, the Zoom F8 is an eight-input, 10-channel solid-state recorder. For all sample rates up to 96kHz the two extra recording channels capture a user-configurable stereo monitor mix alongside the eight individual input channels. However, although the live monitor mix exists, only the eight input channels are recorded if the machine is switched to 192kHz sampling. The F8 is surprisingly compact at 178 x 54 x 140 mm (WHD), but is reassuringly solid, weighing about 1kg with the internal batteries. This is quite a reasonable load to lug over a shoulder — or it would be if the product came with a shoulder strap, which, frustratingly, it doesn’t as standard! A protective bag (with a wide shoulder strap) is available as an optional accessory, but as shipped you’ll have to rest the F8 on whatever you can find on location! What is packed in the box with the F8 are a couple of short TA-3-to-XLR adapter cables, a wall-wart mains supply, a thick paper manual (hurrah!) and a camera-mounting bracket. The last allows the F8 to sit securely under a video/DSLR camera, and the recorder can itself be mounted on a tripod, if required. There are also some download access codes for Cubase LE and Wavelab LE. Recordings are made across either one or two SD, SDHC or SDXC memory cards housed in slots on the left-hand panel, with capacities of up to 2, 32, or 512 GB respectively. Audio can be stored as MP3 and/or BWF in a variety of flavours. MP3s support 44.1 and 48 kHz sample rates, with 128, 192 or 320 kbps bit rates. Broadcast Wave (BWF) files have full iXML metadata and can be saved in mono, stereo, or poly formats, at 44.1, 48 (plus ±0.1 percent for 24/25 frame video pull-up/pull-down rates), 88.2, 96, or 192 kHz sample rates. There are a lot of options here, and the only potential issue I can see is that the stereo monitor mix is always recorded as tracks 9-10 — many TV and film workflows expect the stereo mix to appear in the first two channels of a poly WAV, with the ‘iso channels’ across the rest. Currently, there’s no option in the Zoom to re-order the recorded channels to cater for this, which might be an issue for some potential pro users, although I imagine this could be addressed fairly easily in a future software update. Eight identical high-quality mic/line preamps are provided, with up to +75dB of gain and a very respectable EIN figure of -127dB (A-weighted, 150Ω source). Inputs are connected via combi-XLRs, with channels 1-4 on the left-hand side of the recorder, and 5-8 on the right. The maximum microphone input level via the XLR is a reasonably generous +14dBu, while the central TRS line-input socket is padded down by 20dB to accept up to +34dBu. Individually switchable phantom power is provided on each XLR, and the PSU can deliver the full 10mA of current per channel, if required. The analogue input gain is controlled from a small front-panel rotary knob for each channel, but the rest of the signal conditioning is performed in the digital domain. A fast limiter, a high-pass filter, polarity inversion, and up to 30ms of delay (dependent on sample rate) are provided for each channel. As with most location recorders of a similar form factor, all sides of the Zoom F8 are adorned with controls, inputs and outputs, and in this case it includes eight mic inputs with individually switchable phantom power. Zoom’s standard 10-pin stereo mic connector appears on the rear-panel, to accept any of the company’s accessory mic capsules (XYH-6, XYH-5, MSH-6 Mid-Side array, and the SGH-6 and SSH-6 mono and stereo shotguns). These microphones automatically seize input channels 1-2 when connected. Rear panel. I’m not entirely convinced about the idea of digital limiters and HPFs in a location recorder, since they clearly can’t protect the preamp or converter from overload. Wind noise often generates massive subsonic energy that can easily overload mic preamps long before the wanted audio is raised to workable levels. Zoom’s approach here is obviously the most cost-effective solution, though, and I’m sure it will be adequate for all but the most demanding applications. An in-line XLR high-pass filter would probably solve any issues, if necessary, but since the A-D converters have a claimed dynamic range of 120dB, it should be possible to find a gain setting that captures the entire dynamic range without need of limiters, anyway. Each channel has its own PFL/Solo button, which also activates a configuration screen for the selected channel. Pairs of odd/even channels can be stereo-linked, with or without a Mid-Side decoder, and a slate-mic and an adjustable-level line-up tone source are provided too, activated with a toggle switch just above the LCD screen. The right-hand side of the F8 carries a standard 6.25mm socket for the powerful headphone amp (the associated volume control is on the front panel), plus two sets of two-channel outputs. The ‘sub outs’ are presented on an unbalanced stereo mini-jack socket, while the main outputs appear on a pair of (balanced) TA-3 mini-XLRs (hence the included cables!). These main outputs are switchable for nominal mic or consumer (-10dBV) levels, with 0dBFS equating to -18dBu and +12dBu, respectively. Timecode can be generated and recorded, with inputs and outputs on rear-panel BNCs. The usual record-run, free-run, jam and slave-sync modes are provided, and all the standard timecode rates are supported from 23.976 fps to 30 fps (Drop and Non-Drop). Powering options include a supplied mains wall-wart (connected via a deeply recessed and pleasingly secure coaxial socket on the rear panel), an internal octet of AA batteries, or any external DC voltage between 9-16V connected via a Hirose HR10 4-pin socket on the left-hand panel. Power is switched automatically between the available supplies at selectable minimum voltages. With standard alkaline AA batteries the F8 should run for about 4.5 hours when recording all eight channels at 48kHz, and about two hours at 96kHz. NiMH or lithium AA cells will increase the running time considerably, but an external power pack would be preferable for most location recording applications, with the internal batteries providing an emergency backup. A switchable pre-record buffer ensures nothing is missed if you’re late on the record button! At base sample rates it captures the preceding six seconds, falling to three at double sample rates, and just one second at 192kHz. Audio files are automatically saved at regular intervals to ensure most of the recorded audio remains readable in the event of an unplanned power loss. Left-panel: note the mini USB connector. Although the F8 has no digital inputs or outputs — so it can’t be used with external A-D converters — it does have a mini-USB 2.0 port on the left-hand panel. This allows direct data transfer to/from a computer, but also enables the F8 to serve as a class-compliant USB interface (downloadable ASIO drivers are required for Windows). As an interface it provides eight inputs and four outputs at sample rates up to 96kHz. Unusually, an optional firmware extension enables the F8’s operating system to support remote-control via Bluetooth. 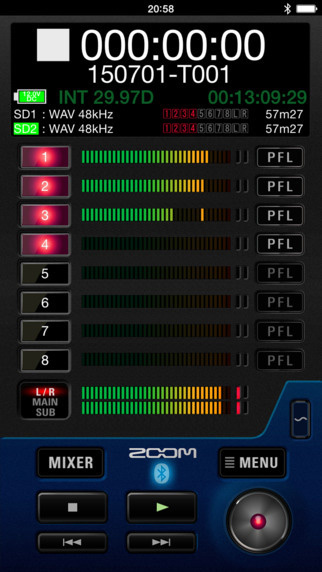 An app for the latest Apple iOS phones and tablets (equipped with Bluetooth 4.0) provides both transport controls and the monitor mixer’s faders and pan pots. The latter makes it practical to adjust the monitor mixer in real-time (albeit with a slight lag). Input levels, timecode, and battery status can all be checked via the app, too, and file names and metadata entered remotely. Packing such extensive functionality into such a small box can make hands-on control difficult, but Zoom have created a remote-control iOS app (for iPhone and iPad) to make this a little easier. Around a third of the front panel is given over to the bright 2.4-inch colour LED display, with a menu access button and select encoder knob (with a push-switch action) immediately alongside. Most of the F8’s settings are configured via a simple menu structure and, although the 137-page manual will be required to comprehend some of the F8’s more sophisticated and obscure functions, I managed to record multiple inputs and build a stereo monitor mix straight from the box without any problems at all. Everything is quite logical and easy to find. The right-hand side of the front-panel carries the primary controls for the eight input channels, each with an on-off button, rotary level control, PFL button, and miniature bar-graph meter. The input gain control covers a 60dB range, configured as +10 to +75 dB for the XLR input, and -10 to +55 dB for the TRS input. Arrayed below these channel-input facilities is a standard set of transport controls and an illuminated power on-off button. Given the compact nature of this device, these controls and buttons are all inherently quite small, but I didn’t have any difficulty operating and adjusting anything, even with my podgy fingers! Having said that, this isn’t a recorder that could be used easily while wearing winter gloves, and the input level knobs don’t lend themselves to adjustment on the fly, even with bare fingers. I found it best to set the gain controls allowing a generous headroom margin, and then disable them (by pressing Stop+PFL) to prevent accidental changes. Although the preamps and converters have a wide dynamic range, a dual-channel record mode is available, in which input 1 feeds preamps 1 and 5, input 2 feeds preamps 2 and 6, and so on. This arrangement obviously halves the input count, but allows two different gain structures to be employed for each input simultaneously. Quiet signals can thus be recorded with a good signal-noise ratio, while loud signals are still captured without fear of clipping — a useful feature when recording an unpredictably wide dynamic-range source! It is possible to adjust the monitor mixer in real time on the F8, but because these are all virtual controls it involves a lot of encoder knob twirling and clicking. The iOS app offers a far more practical solution if you really need real-time adjustment. It’s impractical to describe all of the F8’s capabilities in detail here, but it is an extremely configurable device with a lot of very sensible and useful options. For example, the LCD has a ‘high-contrast’ black-and-white ‘outdoor mode’ to improve legibility in direct sunlight, and a few of the more frequently used functions can be accessed directly through shortcut button options — like pressing and holding the encoder knob to reset all monitor mix faders and pans to their defaults. Some additional shortcut options would be useful, such as a combination that deletes the last file and reinstates the previous take number to cope with false takes, but this kind of thing (and much more besides) can be added easily in software updates over time. The virtual monitor mixer has eight inputs, each being individually switchable between the corresponding input preamp or SD card replay track. 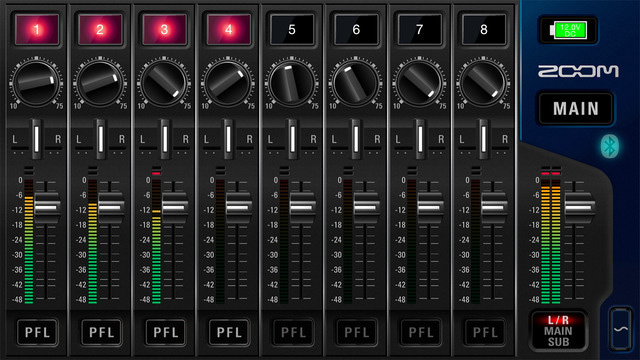 Levels are balanced using virtual faders and pan-pots for each channel, with an overall master stereo bus fader. 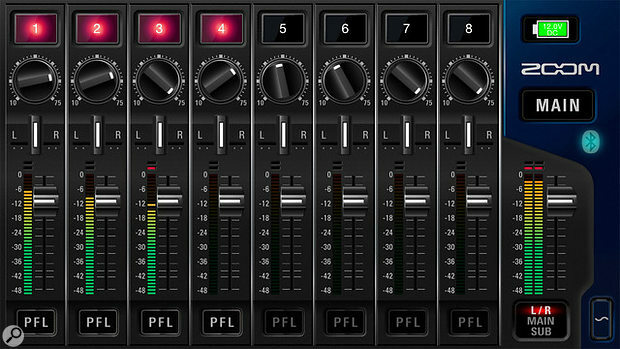 The resulting stereo mix is passed to three separate output routers, which also have direct access to pre- and post-fade feeds of all eight monitor mixer inputs. The first two routers generate the main and sub outputs, with independent source selection for the left and right channels. The third router provides the headphone output, but this also has additional options, including M-S decoders selectable on adjacent input channel pairs, and access to the main and sub outputs’ signals as well. Warning tones for things like low battery, record-stop, record-start, and ‘record not possible’ also contribute to the headphone output (with adjustable level). Whereas the headphone master level is adjusted with a physical control on the front-panel, the main and sub outputs are controlled with virtual master faders, with output limiters, adjustable delays (up to 10 frames), and mic/line output pads also available. The default LCD screen shows the transport mode, timecode, frame rate, and record duration across the top, along with power source and voltage. 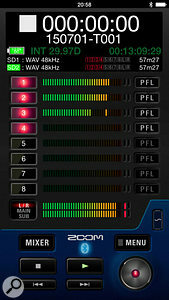 The middle of the screen is taken up with the monitor mixer’s fader/pan settings for all eight channels, with the current file name and a stereo bar-graph meter immediately below. Tucked underneath the meter is a display showing which memory cards are recording what channels, in which formats, and with the remaining record time. Rotating the encoder knob scrolls through alternate displays, starting with a screen showing the main and sub output faders, limiters, delays and pad settings, with the four corresponding bar-graph meters. Other screens show all the input and output bar-graphs together, the eight inputs plus monitor mix bus meters, just the input meters, or just the monitor mix bus and output meters. All the meters are green up to -20dBFS, yellow to -12dBFS and then red up to clipping, but they are marked in a very analogue way with the colour breaks marked as 0dB and +8dB. I’ve not taken the F8 out into the wind and rain to see if it would survive typical location sound abuse, although I doubt it is as weatherproof as some high-end professional recorders. Nevertheless, it does feel solid and durable, and I’m sure it would prove reliable in fair-weather applications. Although surprisingly versatile and configurable, the F8 doesn’t yet satisfy all the peculiar requirements of professional film and TV shoots, but that could easily change with software updates and must be balanced against the fact that the F8 costs around 85-percent less than the high-end location recorders! Importantly, for any application, the F8’s preamps proved very good indeed, being clean, quiet, and with good headroom margins. The headphone amp appears slightly finicky about headphone impedance, seeming to give a cleaner sound delivery with higher-impedance cans, but this is a very minor issue. Overall, then, I am deeply impressed with the F8. It offers excellent capability and versatility in a very compact package, with a design that is generally well thought out. The F8 unquestionably offers remarkable value for money, and nothing else with a comparable number of inputs and recording tracks, let alone the rest of its comprehensive facilities, comes anywhere close. At around 8.5 times the price, the Nagra VI arguably sets the benchmark for eight-channel recorders (although it only has six analogue inputs), while the Sound Devices’ SD-788T (a shade under seven times the F8’s price) is a very popular alternative in the professional film and TV market. The Tascam HS-P82 (just under 4.5 times the F8’s price) forms a very attractive lower-cost option, but the closest direct competitor for the Zoom F8 is the Roland R88 — and even that costs almost exactly twice as much! Clear display screen, with high-contrast mode. Very compact with attractive weight. Eight recordable mic/line inputs, plus the ability to record a stereo monitor mix. Switchable MS decoders on inputs and monitoring. Usable as an 8-in/4-out USB interface. Dual SD memory cards, with facility to record different formats and channels to each. The bag — with its essential shoulder strap — is a cost option. Digital limiters and high-pass filters don’t offer the same subsonic overload protection as analogue equivalents. A very compact but formidably capable eight-input, 10-track solid-state recorder, delivering impressively high sound quality and enormous configurability.